Sudden changes in temperature, moisture, and pest/insect infestations such as woodworm, dry rot, etc. can play havoc with your wood furniture. Wood can dry out, rot away, or get infested weakening it over time and destroying your garden furniture. Every homeowner knows the importance of protecting outdoor furniture from these environmental threats. Wood absorbs moisture and warmth from the air. It swells with heat and moisture in the summer and heavy rainy simply worsens the effects. Wooden garden furniture especially is prone to contract and expand as the temperature changes. As the summer ends and autumn arrives; it is all the more important to protect your wooden furniture from the cold. Cold weather makes wood dry and brittle. It speeds up dry rot infestation as well. Wooden furniture is especially susceptible to damage in places that see large variations between day and night temperatures. The daily cycle of expansion during warmer afternoons, and contractions during cold nights can ruin your furniture for good by affecting its lustre, shine, shape and sonorous qualities. 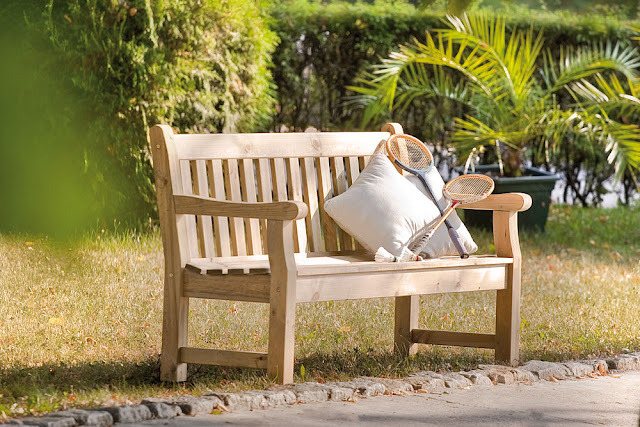 Outdoor furniture, such as a wooden garden bench, is especially prone to damage and needs strong protection measures. Wood preserver is a chemical solution that protects wood from woodworm, dry and wet rot, and halts the daily cycle of expansion-contraction with temperature variations. Wood preserver is applied to furniture either at the time of manufacture, or later on, and is vital to prolonging the life of wooden garden furniture in particular. These chemicals fill the microscopic gaps present in wooden furniture, and suitably expand and contract with temperature changes. Organic solvents are preferable to the other two varieties because they are non-toxic and can be more efficient at preserving wood. You can also buy natural wooden preservatives from most hardware stores these days. Unlike the above mentioned chemical preservatives, these natural preservatives, such as linseed and tung oil, are completely non-toxic. Coating your furniture, especially outdoor furniture like a wooden garden bench, with wood preserver is essential during the winter season. Cold temperatures are unkind to wood; keep your furniture protected by using a quality wood preserver.